Julie Hart is the daughter of the internationally acclaimed Australian painter, sculptor and inventor “Pro Hart”. Julie is perceived by many to be the feminine version of her father Pro. Although his technique runs through her veins, her style is quite different, more refined and detailed as opposed to her father’s bolder, often more assertive style. As a little girl, Julie’s playground was her father’s painting studio and three-story Art gallery, where she would play around his feet while he worked, from this, Pro made an easel for Julie in his studio, and this environment has influenced and fostered her love for art. And thus, Julie and her father had been sharing studios before she was 5 years old. Her mother recalls “I can remember Julie waddling into her father’s studio in her nappy, she would sit and paint just like her Dad”. Julie has in effect been studying under the Master for over 35 years, which continue until his passing in 2006. That close bond is still evident, as Julie will only paint in Pro’s mast Studio’s today, these are the places that Pro created so many artworks that thousands now cherish. While other kids were hardly thinking about their careers, at 14 Julie was showing her artworks at an exhibition in Wagga Wagga, and due to demand, continues to exhibit to this day (with recent showings in France and England). After 35 years of painting, she is now respected as a gifted artist in her own right, with her works now hanging in collections around the world. 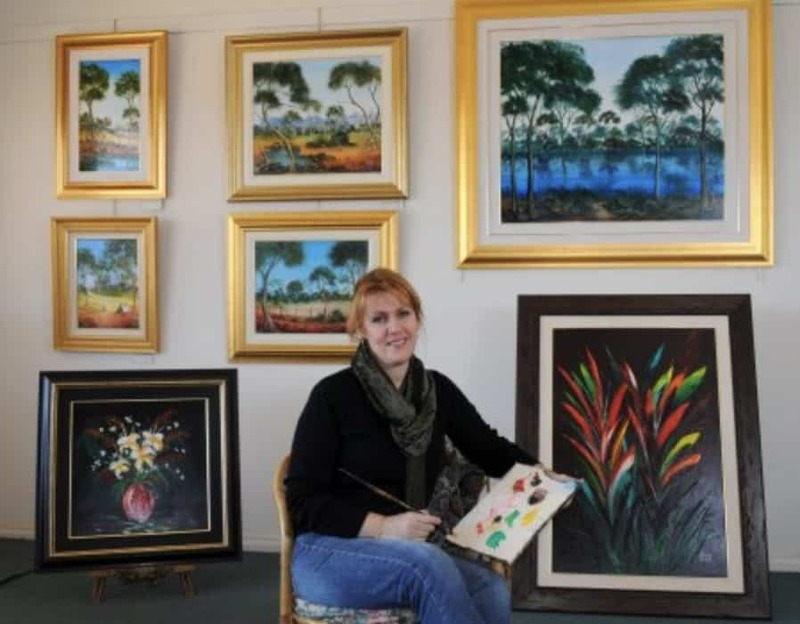 Although demand for her artwork has taken her gar beyond the outback Australian town of Broken Hill, Julie is a shy and retiring woman by nature and tends to shun the limelight, rarely given to public appearances and interviews. Family is an important part of Julies life, preferring to stay close to home rather than move to where “the action is”, and as such declines many national and international invitations to exhibit, although this has not stopped her having many successful mixed and solo exhibitions to date. Julie’s main body of work covers native and abstract flowers, riverscapes, landscapes, working mainly in oil paints with brush or palette knife. Often typifying life in the Australian outback where she lives, her scenes can be really or imaginary usually with a pioneering theme, capturing the vivid heat hazes and strong harsh outback colours of the untamed bush in her landscapes. Or perhaps the softer blue/green hues around the many rivers when they run. Bold striking palette knife florals that jump from the canvas, with thick and solid paints that give a 3- dimensional feel on rich textured backgrounds. Julie hopes to continue the tradition her father started, experimenting with different mediums and textures, and telling pictorial stories that capture the pioneering spirit that made this country great, they tell of a time almost forgotten. With her free and honest approach, Julie’s art is warm and inviting, giving the artworks a sense of tranquillity. Many painters try but few ever attain, such a surreal depth of perception and movement, as Julie creates in her artworks. These qualities and the belief by many that Julie now carries on her father’s mantle, as well as the Hart name, make her work attractive to art lovers and investors alike. This is evidenced by increasing demand and rising prices of Julie’s beautiful artworks. We believe a Julie Hart painting is an excellent opportunity to start a serious art collection or add to the credibility of an existing one. Julie has 3 brothers, and 1 sister and is married with 2 daughters, Amber and Ebony and son, Jordan. Julie lost her second born, Joseph, from Cot Death in 1989. Julie was born and raised in Broken Hill, except for her years away at Woodland Girls College in S.A. She feels grateful that God has given her a gift that people enjoy.